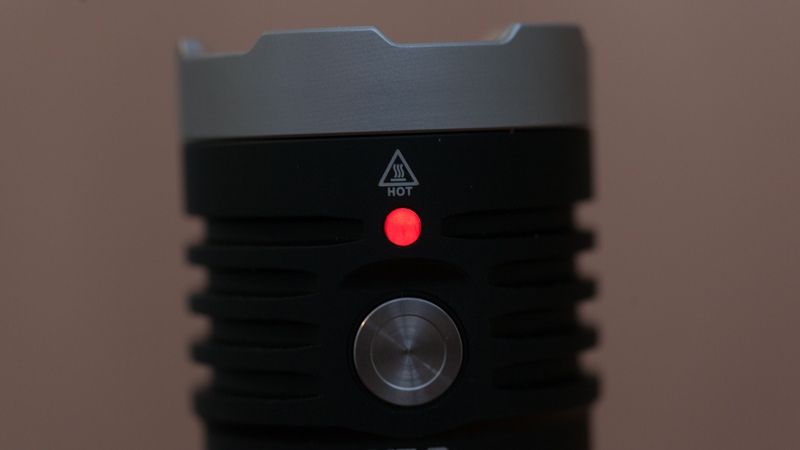 Review example was provided by fasttech. Here is product page at store. 2-3 years ago that would be WOW-review, for such output from such size. 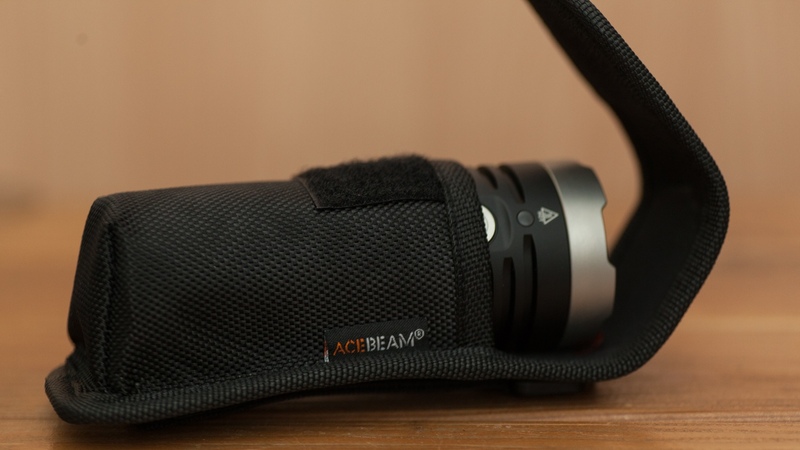 Now, K30 doesn’t impress so much, because Acebeam offer a way more powerful lights. 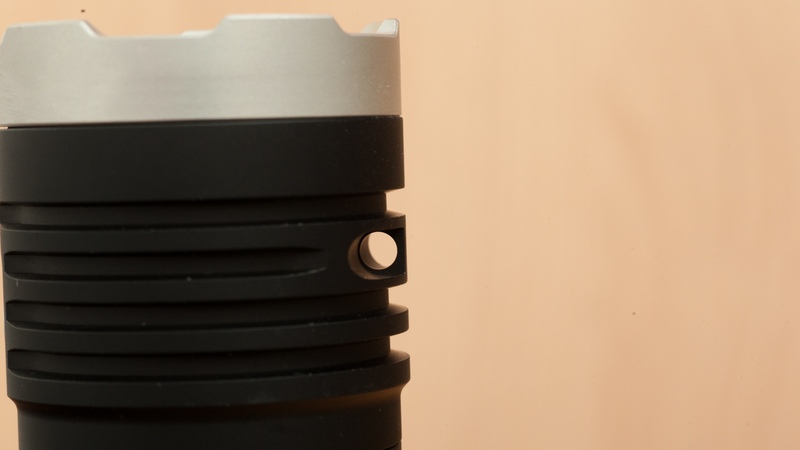 But, still, K30 is a seriously good light, that i`m glad to tell you about. It took me a while to compete this review, as this year winter stayed 1 extra month, and I decided that lots of reflections from snow will ruin pics, so I had to wait this extra month. You can download full-size pics here, but i made all the pics already clickable. 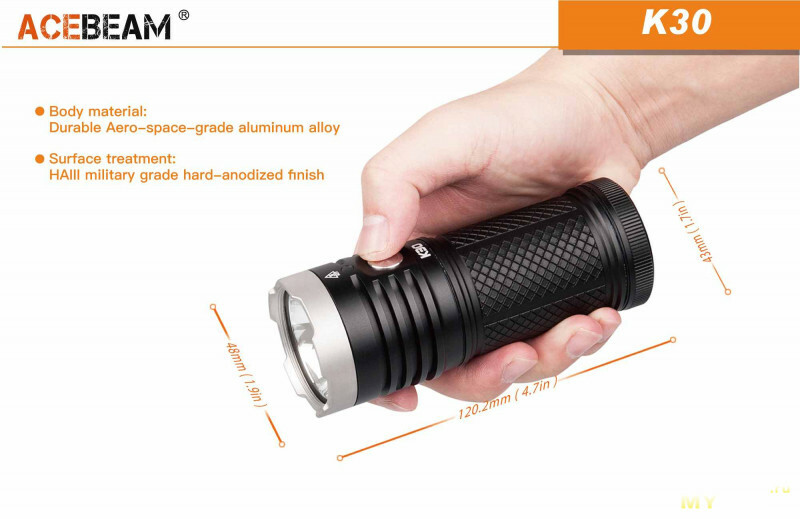 K30 has a well designed and well built package with magnet lock, the last is consider to be feature of top-models. Unfortunately, postal service was tough with parcel, and it was torn a little bit. 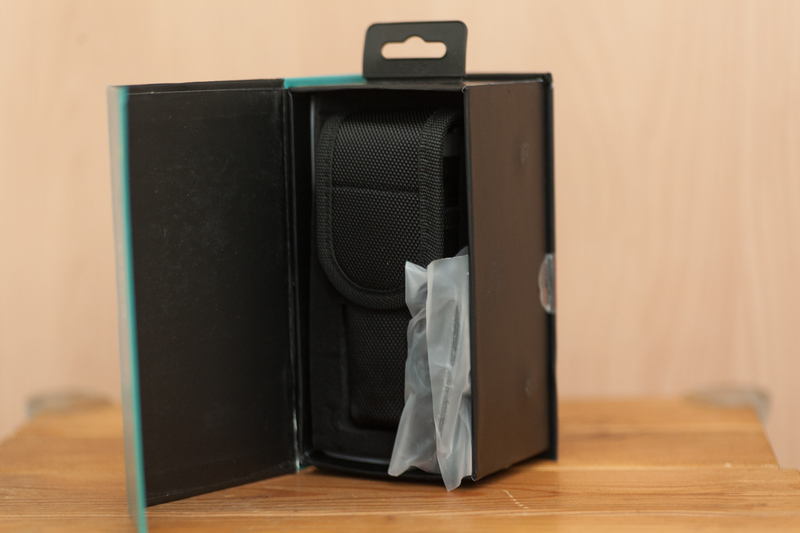 Inside,in black foam rubber lays standart set: flashlight, lanyard, manual, warranty card, o-rings, holster. 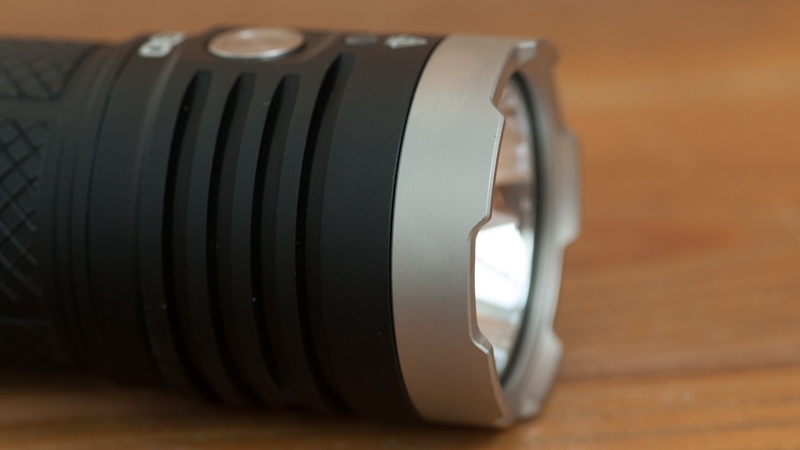 And here is a flashlight itself, it looks good and fits hand as well. 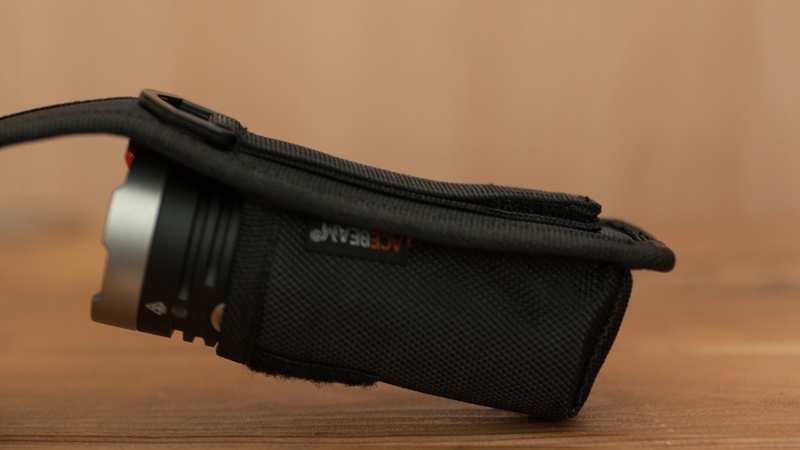 This is qiute compact and lightweight thing, 12х5cm. 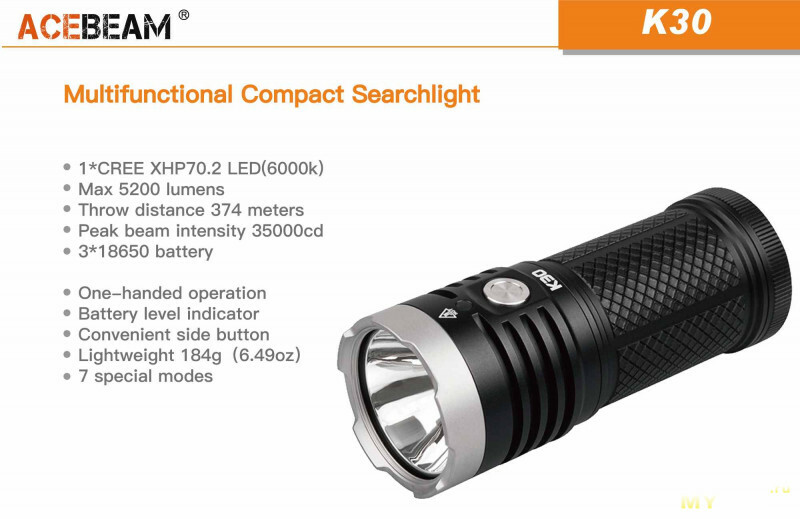 3 years ago, I was astonished by Olight mini intimidator with the same size and so ordinary now 2800 max lums. 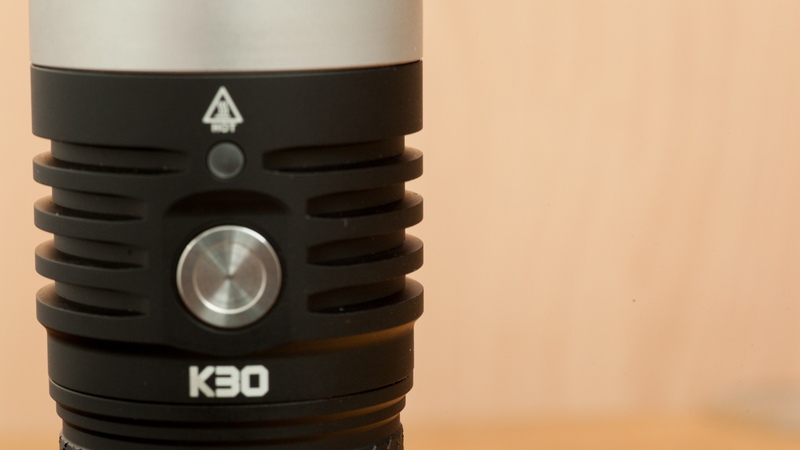 And K30 has an excellent balance between being still compact and already really powerful. With most known things, to give you a clue about size. 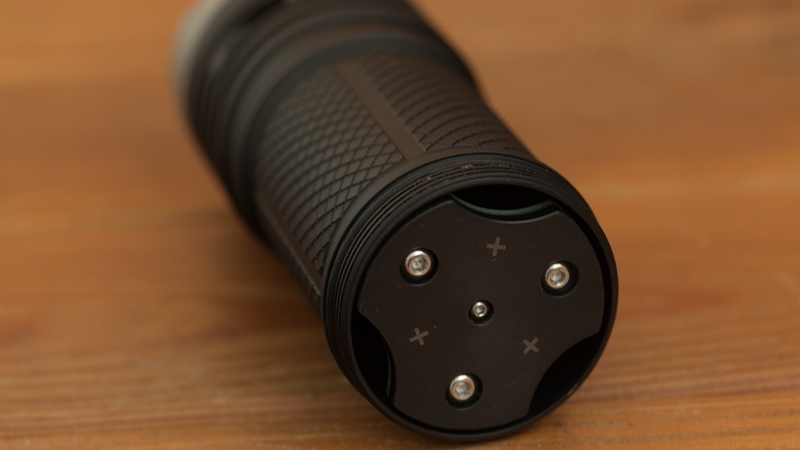 You can unscrew tailcap of K30, but that is no use for you, because all you can see is the bottom of battery cassette. Battery cassette is screwed to head directly. Again, this looks and feels accurate and well build. Threads are quite big and well lubricated. 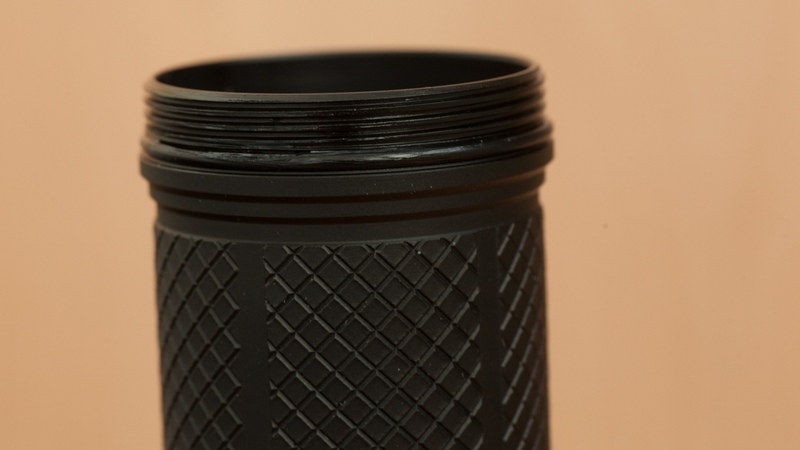 Though knurling is shallow, I don’t feel that grip is insufficient. Cooling ribs are deep, that is good. Surprisingly, there is also hole for lanyard at head, not at tail as usually. There is the button + green\red LED at the opposite part from this hole. Button is clicky, about 1mm deep move. 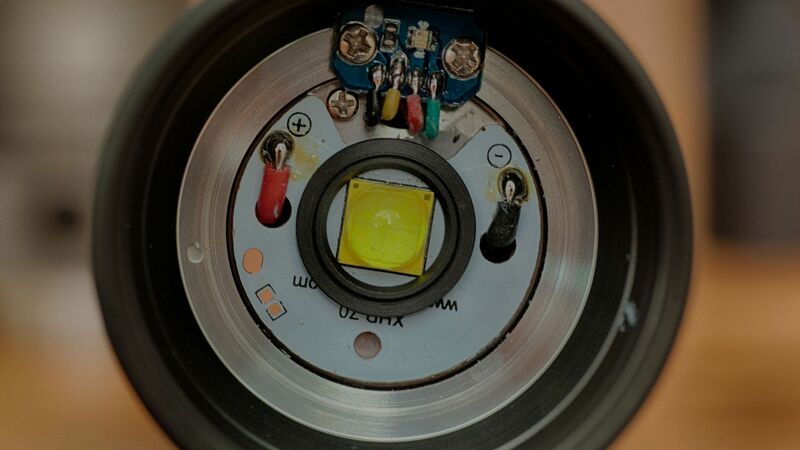 Of course, this small LED gives you information about remaining battery charge. 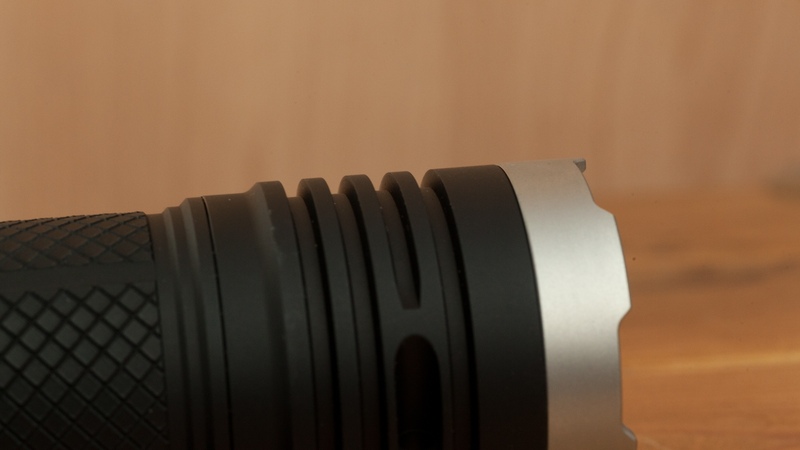 Thought bezel looks small and not that sharp, that is only comparing to K30 big head. 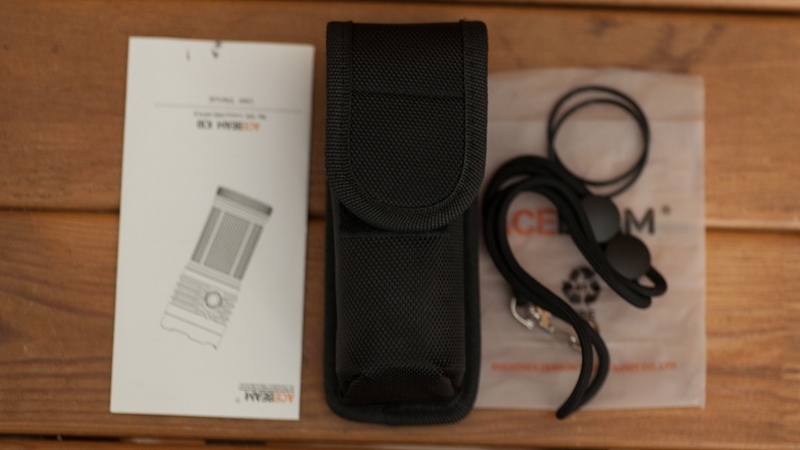 In reality it is quite aggressive and can be used to calm down anyone who has expensive smartphone that you want to be your. Glass is AR couated, and right from the box it goes with protective sticker on. 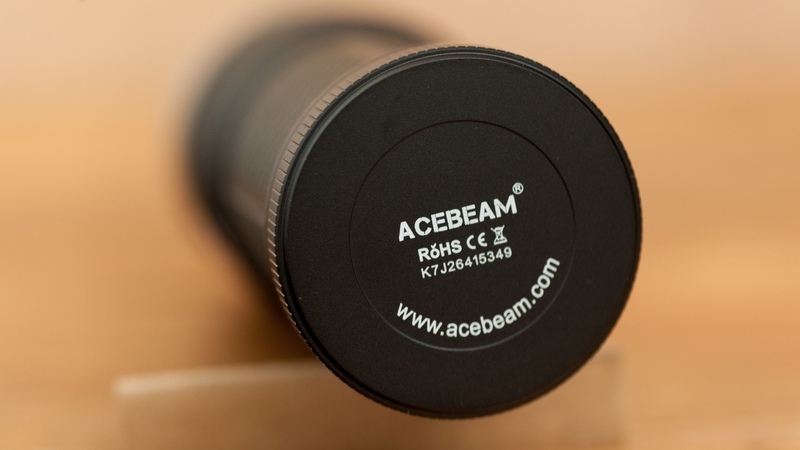 I don`t remember seeing other similar reflectors with such combination of depth and width of SMO reflector. Soldering is accurate, has nothing bad to say about it. And overall, what is about appearance and quild quality, they all looks good. TURBO – 2x presses, TURBO MAX – 2x presses again. 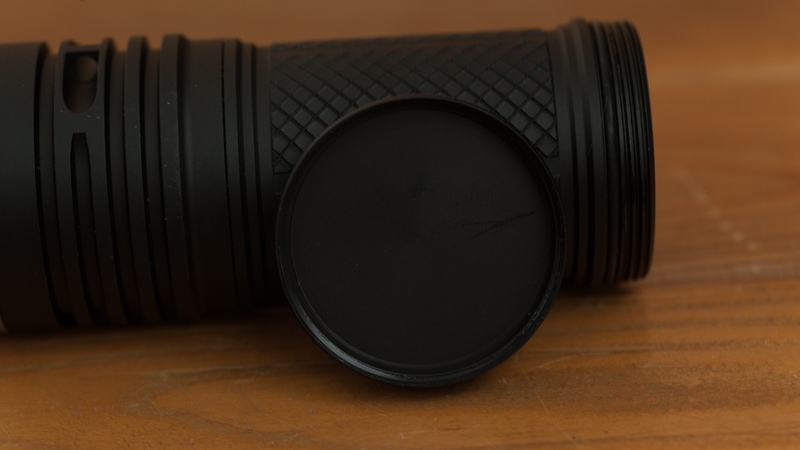 FIREFLY – button hold from OFF for about 2 sec. There is 5000k version, but I got 6000k. There is no PWM-shimmering at any mode. I don`t think that putting SMO here with floody LED and such depth\width ration will significantly increase throw. 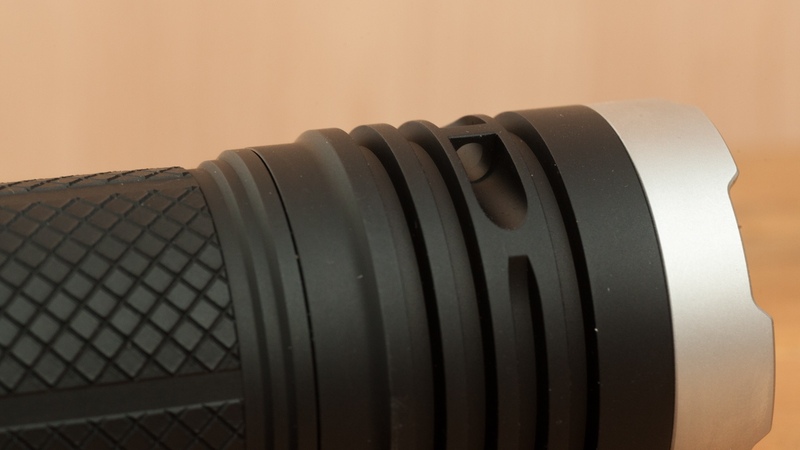 But, still, any small increase is a good bonus, because even with this reflector, K30 is totally usable in close range. 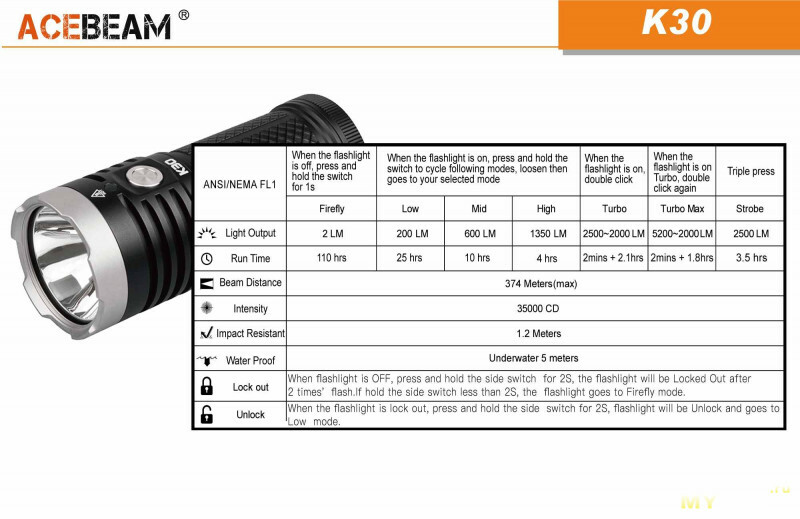 AS you can see on GIFs below, any reasonable and usefull brightness in 200m range can be achieved only in both TURBOs, but buying this light you have to understand the range it works best within. 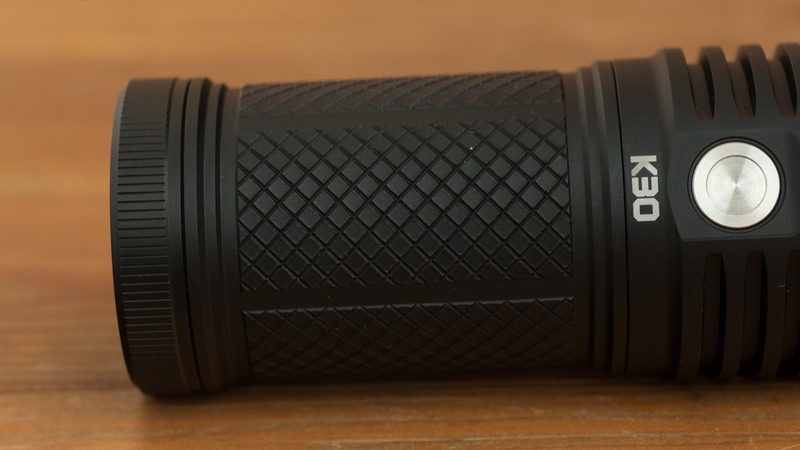 And this is a good clos-mid range flashlight. After initial tests I was confused, so I started to run them over and over again, with 18650GA and VTC6, with and without cooling. And below are my thoughts. 1)	VTC6 performs significantly better than 18650GA in TURBO MAX. Cooling seriously affects as well. Nothing common with stated in specs. 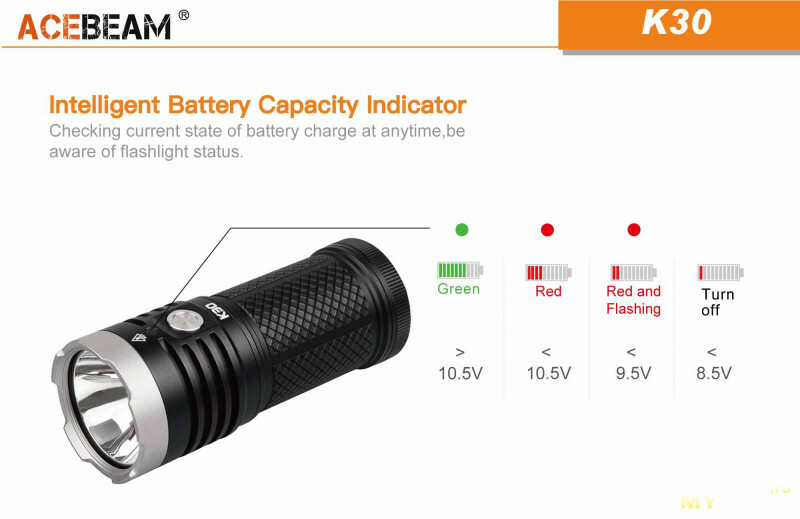 2)	In TURBO mode there is no difference if I use VTC6 or 18650GA, cool flashlight or don’t cool. And still there is no stated 2 min stepdown. Looks like that there is no stepdown in turbo at all! For some reasons this is good, for some it`s bad. All other modes (mid\high) lasts as supposed. 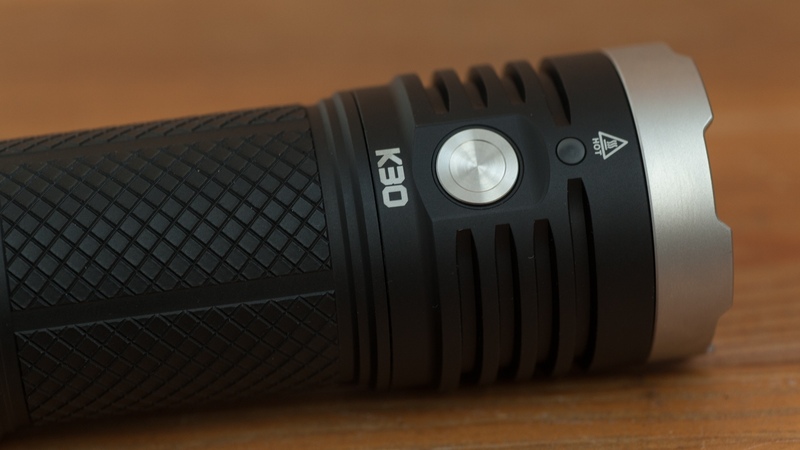 And as heat transfer here is also good, K30`s body gets hot in TURBO really quick, reaching at least about 47 celsius at body, that makes holding flashlight barehand definitely inconvenient. And below are 3 typical distances and I consider to be best to illustrate performance of K30. 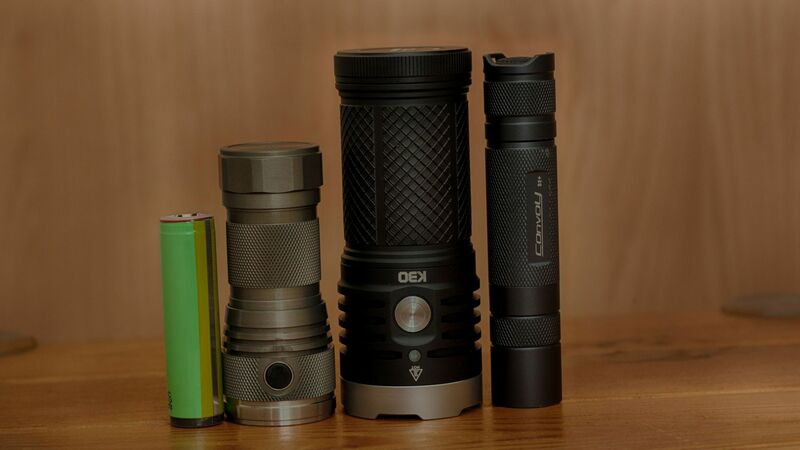 1) about 15m range, most common EDC light range. Here even LOW is useful, MID gives you 100% enough light. 2) about 30-60meters, good walking around distance. 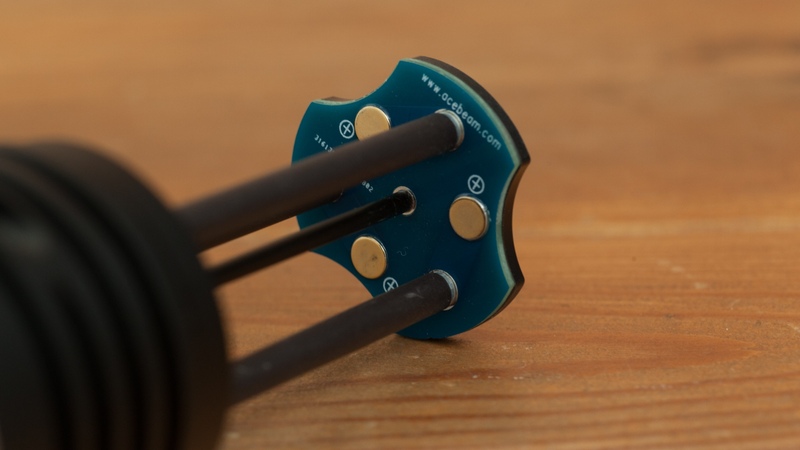 MID is still OK, but HIGH is better, from the far side of distance you can consider using TURBOs. 3) 175. Only TURBOs, and here you can see that light covers a lot of area, rather than focus on throw. I managed to pick good expopare and video below is really close to what my eyes see. 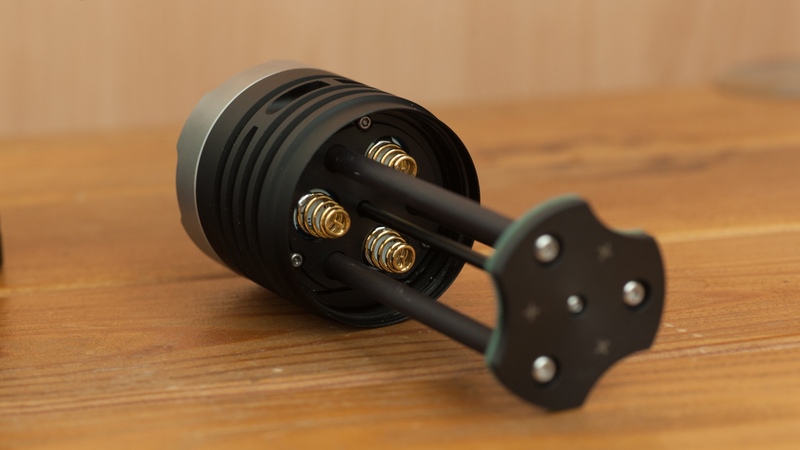 So, in most of cases, MID\HIGH are most useful modes here, there are a few EDC situation, which will require TURBOs. 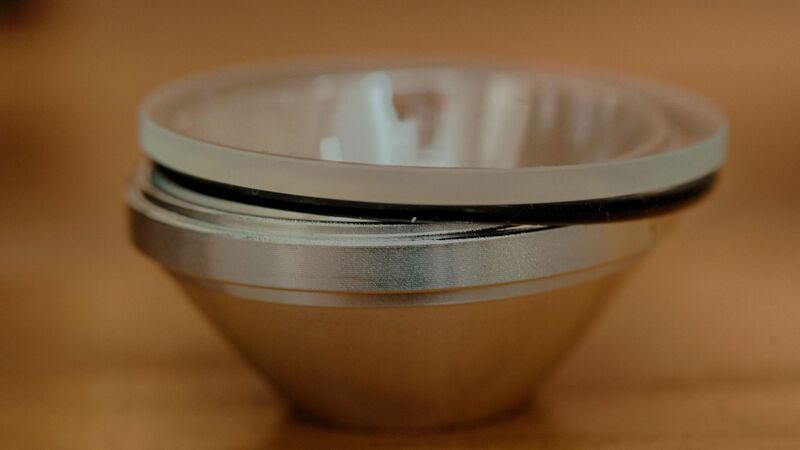 And for simple illumination, 200 lums from low is enough as well, that is brightness that i mostly use in my 14500 light and feel that is ok for me. Runtime in this case will be astonishing. 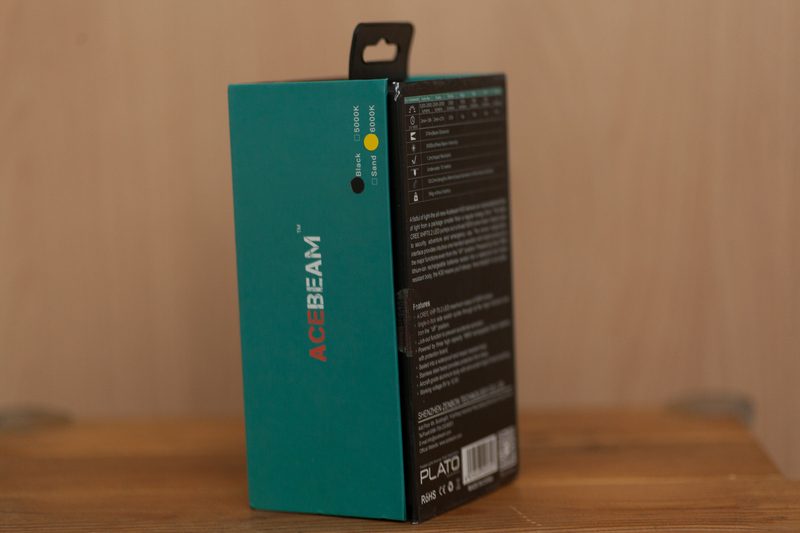 That is my 2nd Acebeam, and 2nd time it is definitely good flooder, with nice balance of compact zise (and you still can carry K30 in pocket) and serious output. Situation with stepdown is really strange, but more in positive way. 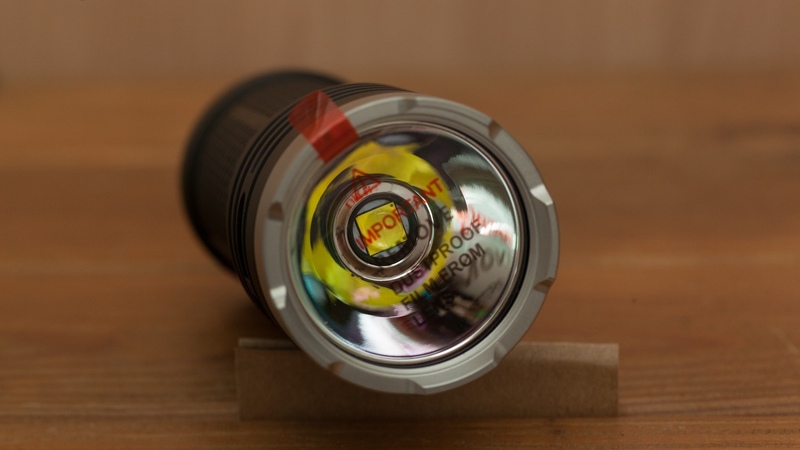 In total majority of situations when I met difference between specs and real performance of flashlight, it was like “ stated 2000k, 1000 in reality”. 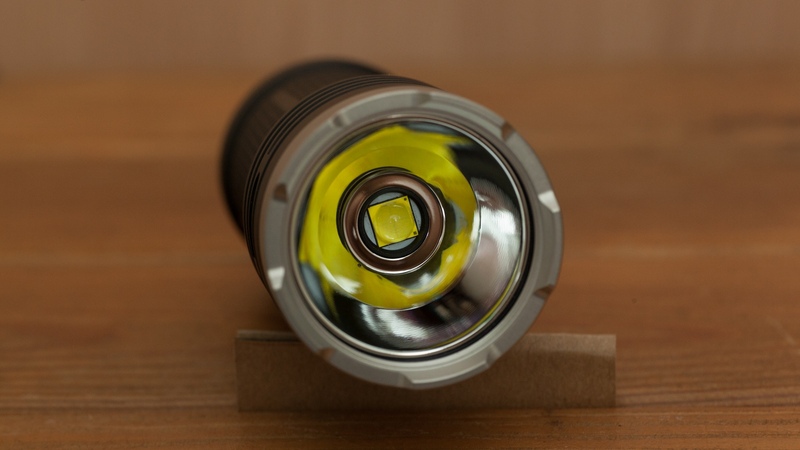 Here turbo definitely seems to be as bright as promised, but lasts longer. 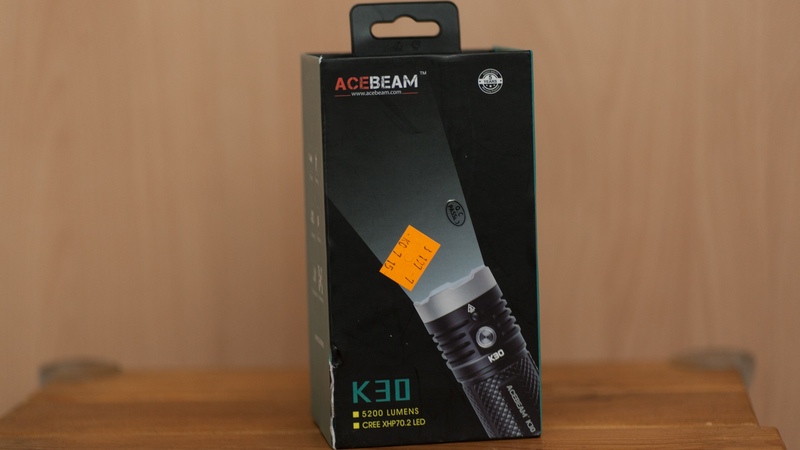 100$ – is a range of good 26650 lights (acebeam EC50 gen2, Klarus G20, Olight R50) and here K30 seems to be good alternative choice. 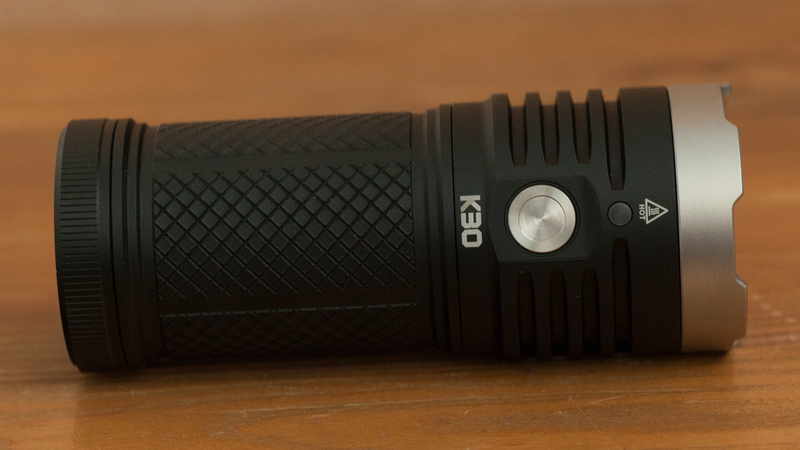 It is slightly bigger and has no USB-charge feature , but definitely brighter and has better runtime. I like this model and think it cost every buck in this price. 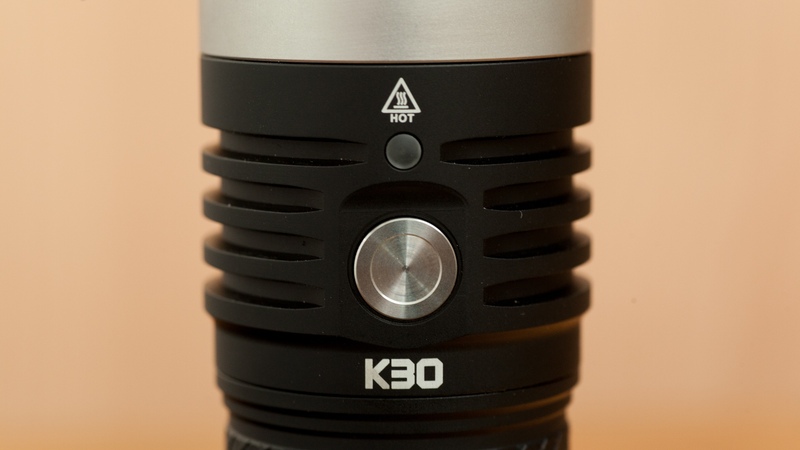 Thanks for the review, my K30 is in the post.